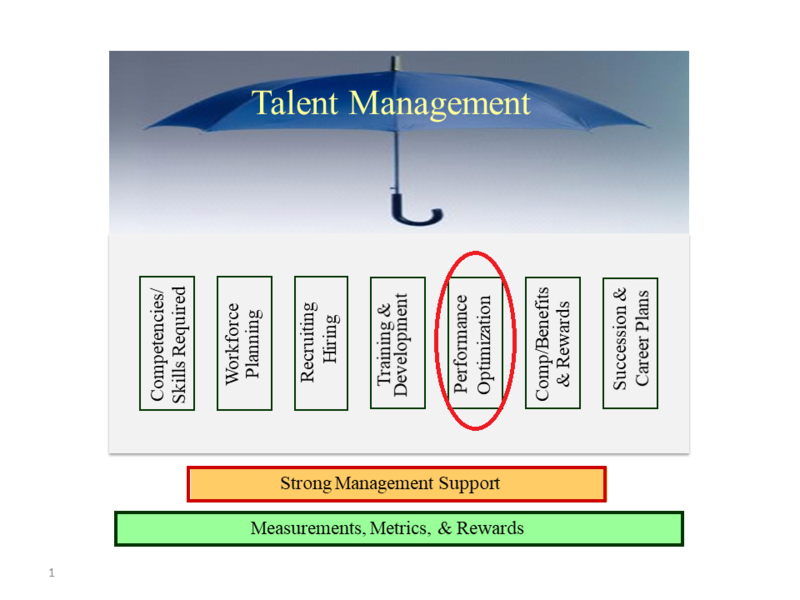 In the previous Talent Management Blogs, we defined Talent Management as a set of integrated organizational HR processes designed to attract, develop, motivate, and retain productive, engaged employees. Hypothetically,we have created the job requirements, determined that we need someone to fill a role, recruited and hired a great new employee and provided the training required to be successful in their new role. So now your “new employee” isn’t so new (+6 months) and you want to ensure their performance is the best it can be… Remember, don’t consider performance management as only having a negative side. Unfortunately, the 80/20 rule tends to force organizations and leaders to place way more time and energy managing the under performers, but ideally, you should be expending 80% of your resources (time and money) on your top performers. They will be responsible for your success in Strategic Execution! POSITIVE PERFORMANCE OPTIMIZATION Employee Engagement is all the rage now – as it should be. Following the basic principles of employee engagement is a good start for optimizing performance, but remember that it is only one part of a successful Talent Management process. Some of the key principles include; a corporate strategy, providing clear communication/feedback, training management and leadership, walking the talk, providing dedicated engagement training and resources, make accountability a norm and ensure there is clear direction and performance measures for all levels throughout the organization. Group50 published a previous Group 50 blog reviewing a process to follow when optimizing performance. Providing coaching, feedback and improvement discussions is a significant part of every manager’s role and when done properly will go a long way in improving short term and long term results. Negative Performance Optimization When performance is based on metrics most employees will clearly understand how they are doing long before a discussion ever happens. However, when an individual’s performance is not meeting expectations it is time to do some root cause analysis and make sure the that business policies, procedures and processes aren’t the real cause of poor performance. When none of these exist, then the focus needs to be on the employee (including contractors, temps, suppliers, distributors, etc.). When they not responding to coaching, it is time to place the them in a Progressive Discipline Process. 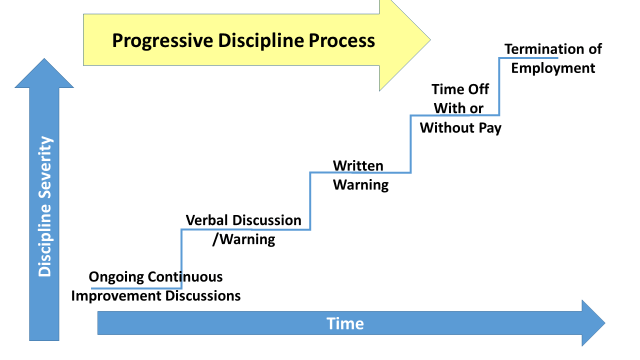 The key principle of a progressive system is to impart the smallest amount of discipline to regain a productive employee. While the diagram shows a linear stair step approach, often the actual process will have several “loop-backs,” or be “stuck” in one area. If the triggering event is severe enough, you can bypass multiple steps. As in most personnel discussions, ALWAYS discuss the more difficult cases with your HR resource and/or your employment lawyer. Now that you have hired the best employee, provided training and defined optimal performance via metrics based objectives and are holding people accountable to those standards. It is now time to determine how best to reward this great performance! The next blog will discuss the Compensation/Reward Systems and how these affect employee behaviors, attitudes and performance. If you wonder about how well your Talent Management process is working, click on the following link to complete this simple HR Self-assessment. The free self-assessment takes only a few minutes and your results will be sent to you immediately along with information on how your company stacks up against benchmarked best practices.